For decades, biologists have believed a key enzyme in plants had one function—produce amino acids, which are vital to plant survival and also essential to human diets. But for Wellington Muchero, Meng Xie and their colleagues, this enzyme does more than advertised. They had run a series of experiments on poplar plants that consistently revealed mutations in a structure of the life-sustaining enzyme that was not previously known to exist. Their discovery could alter the course of gene functional studies in plants and, if applied, it could squeeze more potential out of poplar as a renewable resource for making biofuels and bioproducts. "At first, we thought it was a mistake, because the enzyme does not need to bind DNA to perform its known function," said Muchero, a biologist at the Department of Energy's Oak Ridge National Laboratory. "We repeated the experiment multiple times and kept seeing evidence in the data that the same gene involved in making amino acids also regulates the function of genes involved in producing lignin." "This regulation is happening at a higher level in the plant's overall biological system," he added. They found that poplar plants with certain mutations created unexpectedly low levels of lignin across different environments and tree ages. Lignin fills spaces in plant cell walls to provide sturdiness. 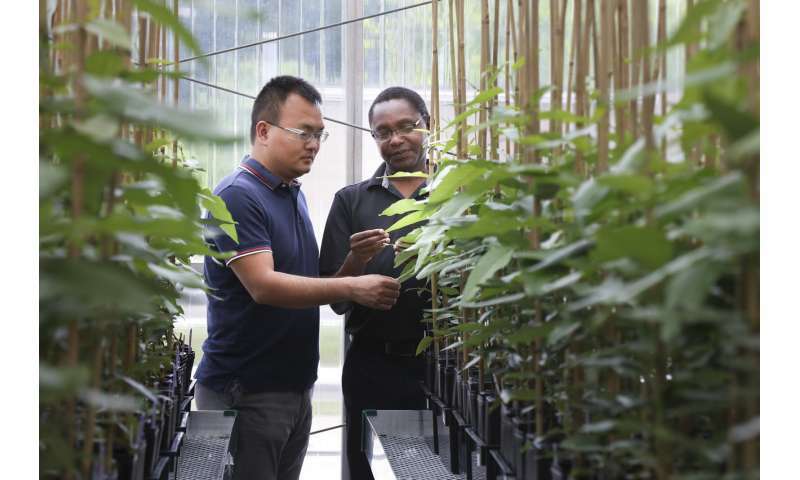 Muchero and his team study the genetics of poplar as part of the lab's the Center for Bioenergy Innovation, or CBI, to develop methods to grow modified varieties with low lignin content. Less lignin makes plants easier to breakdown during the industrial poplar-to-biofuels process. Based on its known function, the only strategy to reduce lignin production using this amino acid-producing enzyme would be to slow down its biological activity. "That approach would be lethal," Muchero said. "In fact, it is the recipe used in common herbicides." As they continued their research, the scientists noted the amino acid-producing enzyme deviated from its anticipated journey through the plant's cells seeking out chloroplasts, which contain chlorophyll, the molecule that absorbs energy from sunlight, giving plants their green color and capturing carbon dioxide through photosynthesis. Instead, their work revealed something unexpected: the additional section of the enzyme allowed the enzyme to enter the nucleus, which is the plant cell's brain center, and "moonlight" as a DNA-binding regulator of gene expression. Discovering the direct connection opens new opportunities to tweak how lignin is produced in poplar without impacting other biological processes that could kill the plant. "This enzyme's unique behavior contrasts with conventional wisdom in the plant community," Muchero said. "While we do not know how this new function came about in poplar, we now know that this enzyme exhibits the same behavior in other plant species." The new insights will help support ORNL industry partners GreenWood Resources and Forage Genetics International who have licensed the poplar gene technology for separate applications, but each with the common goal of breeding plants with modified lignin content. "This discovery has enabled the new Center for Bioenergy Innovation to rationally design plants with either increased or decreased lignin," said Jerry Tuskan, CBI director at ORNL. "Modified lignin in plants can lead to valorization of lignin and displacement of petroleum as a precursor for plastics," he added. "One day, drinking bottles or plastic toys may come from poplar plants." The team published their findings in The Plant Cell journal. Yes, Genetic Engineering based on Mutations is a Good Idea. We know that Pitcher Plants consume insects. Since we don't consume those Pitcher plants, We should introduce suitable Animal gene into them so as to make them manufacture animal proteins. World has a MULTITUDE of Animal species. If one doesn't work, some other might. WHAT IS THE USE? Expansion/Advancement of BIOCHEMISTRY field ! We can then focus on How could it have accepted that gene etc., Similarly, we have so many Plants that we don't consume either. Similarly, we have so many Plants that we don't consume either. We should introduce Plant genes into rat zygotes etc., and see what happens ! Any (if any) general measurable decline in global insect populations cannot possibly be caused by current GMOs and its idiotic to claim that current GMOs could do this. Loss of insect habitat + general pollution, NOT current GMOs, could potentially result in a general measurable decline in global insect populations. The typical idiotic hysterical illogical paranoia against GMOs is threatening to put a stop to the many huge potential environmental benefits that could come from GMOs. I am all for environmentalism but the environmental movement has been hijacked by loonies that got it all wrong about GMOs and many other things. Synthesizing DNA is a growing business as companies order custom-made genes so that they can insert them into plants or animals or try out new CRISPR-based Disease therapies. EASy (Evolution by Amplification and Synthetic Biology) enables the back-to-back incorporation of hundreds of copies of a gene—which contains the code for a specific enzyme—into a cell. Fusion of enzymes from 2 different species of bacteria contributed to microbes to convert LIGNIN, a major component of plant biomass, into valuable chemicals. U.S Dept of Energy Improves Enzyme's Function Dramatically using Genetic Engineering Technique !